Central Michigan University issued the following announcement on Feb. 15. Teamwork, communication, problem solving and critical thinking are the skills employers say they most want. They also are necessary components to win at the Central Michigan University ERPsim Invitational Competition. The SAP-based business simulation game is an opportunity to build professional skills, develop professional networks and have a little fun in the process. SAP is an industry leader in enterprise resource planning software that integrates an organization's accounting, purchasing, production, human resources and other business functions. Employers from around the state and, increasingly, from around the nation attend CMU's ERPsim as team mentors and to recruit top talent for internships and jobs. This year, the four-hour business simulation game places student teams at the head of fictional cereal companies. Students practice together for months leading up to the competition to develop a strategy that includes sales forecasting, purchasing raw materials, setting competitive pricing, managing inventory and marketing their product. These practices are completely voluntary — students receive no extra credit for classes when they attend sessions several times a week for many hours at a time. 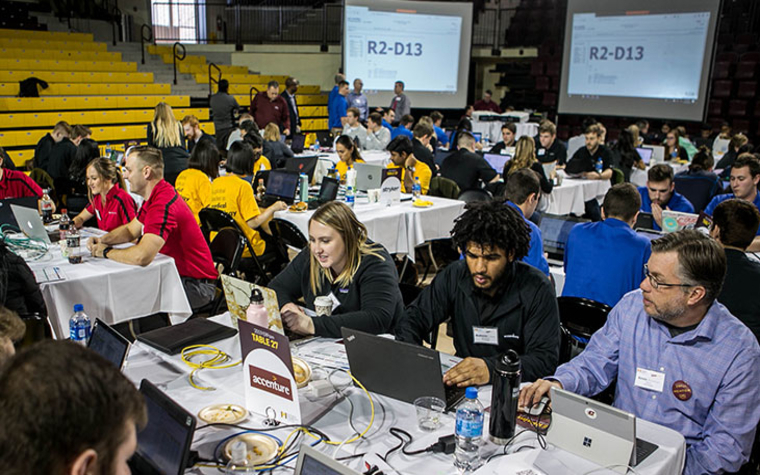 Stephen Tracy, director of CMU's SAP University Alliance, said teams had logged more than 15,000 hours of practice leading up to this year's competition. Students receive guidance and support from professional mentors during the event. Their success depends not only on having a great strategy and skill working with the SAP system, but also on their ability to work collaboratively under high pressure as they face challenges from competitors. Here's a look at how two very different teams approached this year's competition. Lauren Zambon, Canton, Michigan. Major: accounting. Minor: business information systems. Vincent Dipaola, Milford, Michigan. Major: business information systems. Ashley Dzimira, Romeoville, Illinois. Double major: accounting and business information systems. Alexander Dixon, Shelby Township, Michigan. Major: accounting. Minor: business information systems. Team mentors: Dawn Solomon and Lisa Shipp, both senior SAP business process analysts. For the sophomore students of team Haworth, almost everything about the ERPsim competition has been a new experience. When they decided to enter the competition in October 2018, none had ever taken an SAP course or even worked with the software. "We're just getting comfortable with the mechanics of the system and how to use it most effectively. It's a little intimidating to compete against teams with several years of SAP experience," Vincent Dipaola said. Members of the team manage stressful practices with laughter. The group was matched with Dawn Solomon and Lisa Shipp from Haworth. The two mentors bring more than two decades' worth of SAP experience to the team, and Solomon previously served as a mentor for a winning team. "They're like sponges — they listen, ask questions and want to share their strategies," Shipp said of the students. The Haworth mentors have been helping the team build strategies, always emphasizing the need to anticipate what may happen and have well-thought-out counter strategies ready to go, Solomon said. Their Strategy: Focus on improving their skill with SAP and have fun. They have been meeting for several hours a few times each week for months, giving up nights and weekends to work together. During these practices, each member of the team tried different roles. Through trial and error, they determined who would be responsible for each aspect of business operations, and they've been keeping careful notes on what has worked well and what hasn't, Ashley Dzimira said. Learning to delegate responsibilities and place trust in one another has been a challenging — and rewarding — experience for all of them. Last minute changes to their strategy yield mixed results for team Haworth. "We are all type-A personalities. It can be hard to give up control and depend on others, but that's how you succeed as a team. We have to learn to share responsibility and trust one another's judgment," Alexander Dixon said. While the team hopes to give Solomon another trophy to add to her ERPsim collection, they believe there is much more at stake than a prize. "As more and more businesses implement SAP into their daily operations, prospective employers are looking for people who understand the system well. This experience gives me the chance to practice and improve my proficiency," Dzimira said. Luke Krausman, Bloomfield Hills, Michigan. Major: business information systems. Devon Huggins, Clarkston, Michigan. Double major: purchasing and business information systems. Max Miller, West Bloomfield, Michigan. Major: accounting. Minor: business information systems. Sam Cozik, Lainsgburg, Michigan. Major: business information systems. Following a fairly successful performance at last year's ERPsim event, team abatUS members Luke Krausman and Devon Huggins were ready for another chance at winning. They asked to remain partnered with their mentor, Martina Prahl, who brings more than a decade of SAP experience to the team. When two of their previous teammates graduated, they quickly recruited friends to fill their team in order to compete again this year. Max Miller and Sam Cozik had both participated in classroom SAP competitions and were eager to compete in the event. "We finished as the top team in our last practice round. We're comfortable with our product and our strategy — now we have to focus on how well we respond to changes during the competition and reacting to the performance of other teams," Krausman said. Members of team abatUS are in constant communication about their company's performance. Miller said he's been scoping out the competition, trying to get a feel for the strategies of the other teams ahead of the game. Following each practice, the team is able to review data from competitors, including their pricing and sales information. Miller said his team was looking for patterns and trends — and he knows other teams are doing the same. "It's all very friendly, and it's one of the coolest parts of the event. We're in competition with each other, but we're also learning alongside each other and helping each other out." Their strategy: Stick to the strategy, but be ready for curveballs. While the team feels confident about its strategy, the members are aware they'll need to be ready to adapt during the game. "You can have a strategy that is working well going into the event, but working against new teams introduces new inputs and challenges. You have to take it all in and come up with new tactics and new solutions," Cozik said. Team abatUS celebrates the end of a successful first round of competition. Prahl said one of her favorite bits of advice to give is: "Always stay calm and never panic. Panicking never makes sense." She said she encourages the team to remember the reasons behind their strategies as they react to changes and to remain coolheaded. Team Haworth found themselves making significant — even risky — changes in the second round of the competition. Adding a new product mid-game didn't work out well for them, but their investments in their operations seemed to boost their bottom line. Team abatUS also found themselves rethinking their strategy in the second round. Their decision to cut down their production and inventory ultimately cost them in sales at the end of the final round. While both teams went in hoping to win prizes, including scholarships and bragging rights, members of both groups felt good about improving their proficiency with SAP and their overall performance in the competition. They're also keenly aware of another big benefit to competing in the ERPsim: the chance to show future employers what they can do. Four students from team Blue Cross Blue Shield Michigan received on-the-spot job offers at the end of the event, and dozens of additional students secured offers for internships and jobs this summer. "The ERPsim is kind of like the most fun job interview you will ever have, because it shows off your communication, teamwork and problem-solving skills so much better than simply answering questions ever could," Zambon said. "This competition gives us the chance to showcase our skills in real time with hiring managers from some of the top companies in the nation. It's something we can talk about in job interviews. This experience definitely gives me a leg up on candidates coming out of other programs," he said. Want to get notified whenever we write about Central Michigan University ? Next time we write about Central Michigan University, we'll email you a link to the story. You may edit your settings or unsubscribe at any time.